Wrought iron has been appreciated as a building material for centuries, and when it’s used as part of a gate or fence design, it can bring an authoritative and beautiful presence to any property. 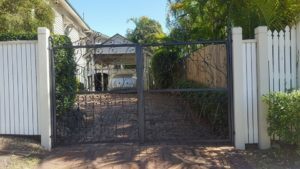 Gates not only provide access to and from a property and a convenient entry point for both vehicles and pedestrians, wrought iron gates and fences also create an impression and add value and street appeal to homes and businesses. One of the most common reasons people choose a metal gate or fence for the exterior of their home is because of their classic appearance – they exude a sense of luxury and history and are the epitome of old-world beauty. Genuine wrought iron gates are actually few and far between because they have a tendency to rust, particularly in damp or salt air environments. In these environments, other materials are more commonly used, and with today’s modern and sophisticated treatment processes, it’s almost impossible to tell the difference between them. Quality iron is a product that has the ability to withstand all types of weather, including the harsh climates of the Gold Coast, Brisbane and the Sunshine Coast. And with our robust protective coatings and expert installation, you can be assured your iron gates will last a lifetime. So what are some of the main types of wrought iron gates? One of the more common reasons people choose wrought iron fencing or gating is for privacy reasons. Commercial metal fencing can be used to reduce visibility around a perimeter, to keep undesirables out of the general area of the property, or both. Depending on the type of privacy required, various designs can be created, and many feature hand-forged elements that complement your home’s architecture and your own personal style. Driveway gates are so much more than just a way to restrict access. From rustic mountainside retreats to waterfront mansions by the beach, wrought iron has the potential to capture a range of artistic styles including Art Nouveau, Gothic and even Baroque styles. Commanding attention and creating a distinct impression, our iron gates are an important feature of any property and are built to stand the test of time. Prefer something a little different? We also offer a personalised design service that can create unique and customised wrought iron styles that will suit your both your home and your aesthetic preferences. We offer bi-parting, swinging and sliding gates, we can also include design elements like regal spears, sweeping curves, intricate twists and spirals, and horizontal and vertical columns. Have a sacred getaway in the garden that you’d like to make even more intimate? Wrought iron garden gates can create an enchanting entryway into that special corner of your outdoor haven, and can be designed to match your privacy or driveway gate. And what about a lovely wrought iron trellis to finish off your floral escape? Our master blacksmiths can tailor any type of decorative or ornamental design you have the imagination to dream of. Number one, pool safety fences and gates are about safety, so their construction and installation must be first-rate. And of course they don’t replace proper supervision of children, but they can provide a tremendous sense of security, particularly if they’re made of such a hardy and robust material as wrought iron. A pool safety fence can also greatly enhance the look of your outdoor pool area. With the addition of ornamental, artistic and architectural accents, a wrought iron pool safety fence can not only look spectacular, it can also raise the real and the perceived value of any property. Our team can custom design your pool safety fence to suit any specifications and your individual style preferences. Whether you prefer classic designs, intricate curves and spirals, or love the grandeur of columns marked with traditional fence spears, your options are virtually endless. Not exactly a ‘gate’ but worth a mention because of their ability to truly transform wrought iron into a work of art. Balustrades are not only an attractive indoor and outdoor design feature, they are an important safety precaution featured on railings, stairs, decks and balconies. Iron’s malleability means that intricate curves, twists and other motifs can be incorporated into each balustrade pane, from symmetrical iron balusters as part of a Mediterranean style villa, or regal spirals below a polished timber staircase railing. Handcrafted to suit your design preferences, every separate baluster can be a feature in itself while also complying with the relevant building codes and specifications. Whether indoors or outdoors, we manufacture and install a range of balustrading designs that will last. Unlike timber or aluminium that can rust and rot, wrought iron will stand up to all weather conditions making it the perfect material to use for deck, balcony and veranda balustrading. And forget about maintenance. With a protective coating and an impenetrable core, our iron railings and balusters are guaranteed to last a lifetime. And unlike glass that requires constant cleaning, our decorative iron balustrading is virtually maintenance free! Established in 1992 by blacksmiths Joel Dean and Andrew Wilson, Dean-Wilson Iron creates spectacular hand-forged wrought iron products including gates, security fences, furniture and balustrades. Celebrating 25 years this year, the company are renowned as the premium choice for bespoke iron artistry in Queensland. For all your wrought iron gate needs, get in touch with the experts at Dean-Wilson Iron on 3814 0076. Previous Post 5 Reasons To Get Custom Made Security Doors for your Home!Next Post How Do Blacksmiths Work With Wrought Iron?